Well, actually, first I will gripe about Japanese beetles (Popillia japonica). Is there anything the little bastards won’t eat? My poor witch hazel (Hamamelis virginiana) is not looking too happy right now. They’ve also been feeding on the eggplants (Solanum melongena), but I can live with that. 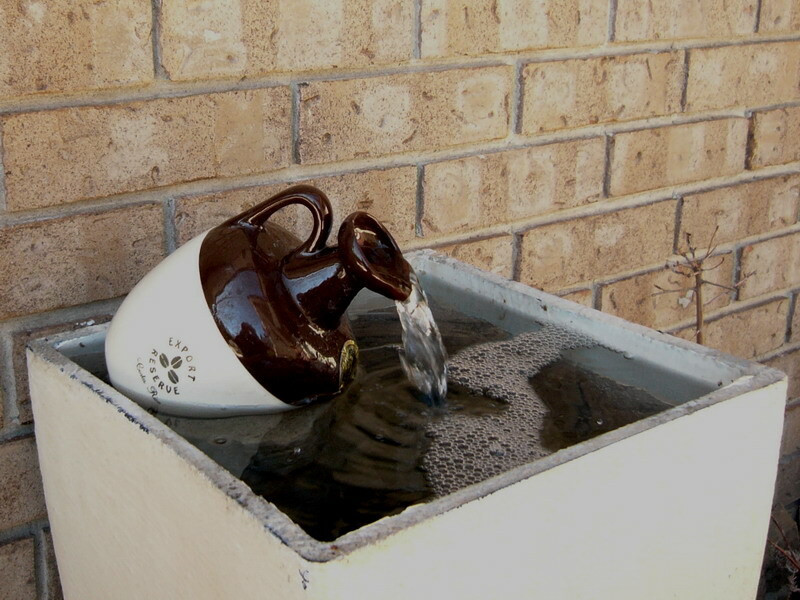 I hate the stuff, but the plants were foisted off on me in spring. I figured it would be a good learning experience in case I’m ever asked how to grow them…I can always give the nasty things away to the neighbours when they start producing. Anyway, I harvested the garlic (Allium sativum) last week, but it’s been disappointing. The heads are not as large as they could be because of the unusually dry year (spring) we’ve had. The lemon cucumbers (Cucumis sativus) are still alive, which is a small and pleasant surprise. They’ve been hit with bacterial wilt because of the damned striped cucumber beetles (Acalymma sp.) and I’ve been carefully pruning off anything that looks infected, so I’ve actually been getting a reasonable harvest off them. 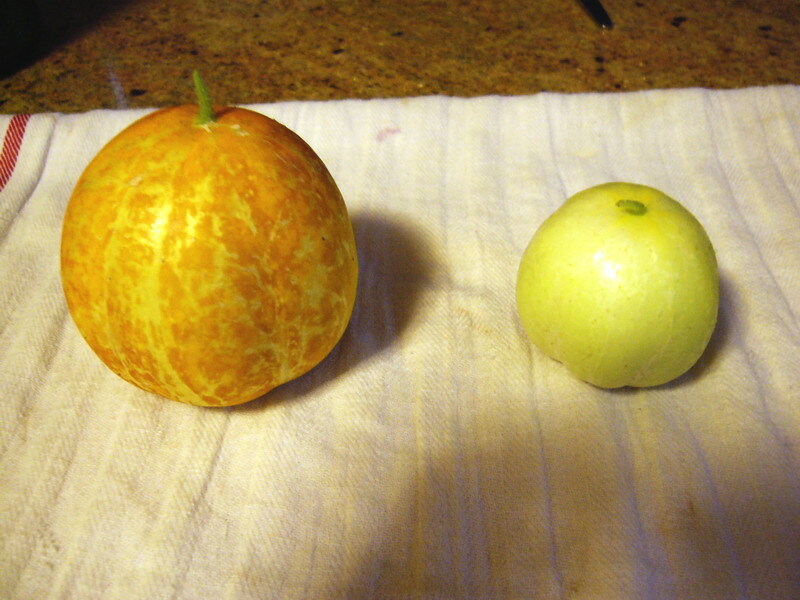 Here is a picture of a couple lemon cucumbers – the one on the left is one that I somehow kept missing, so it’s grown to full size (about the size of a baseball) and gotten ripe. The one on the right is more what a harvestable specimen should look like. Although lemon cucumbers don’t get bitter with age (as I did) like other cucumber types, the seeds do get large and hard. Also, once cucumbers are allowed to ripen, the vine slows down production or stops completely. But you can see why they’re called “lemon” cucumbers. 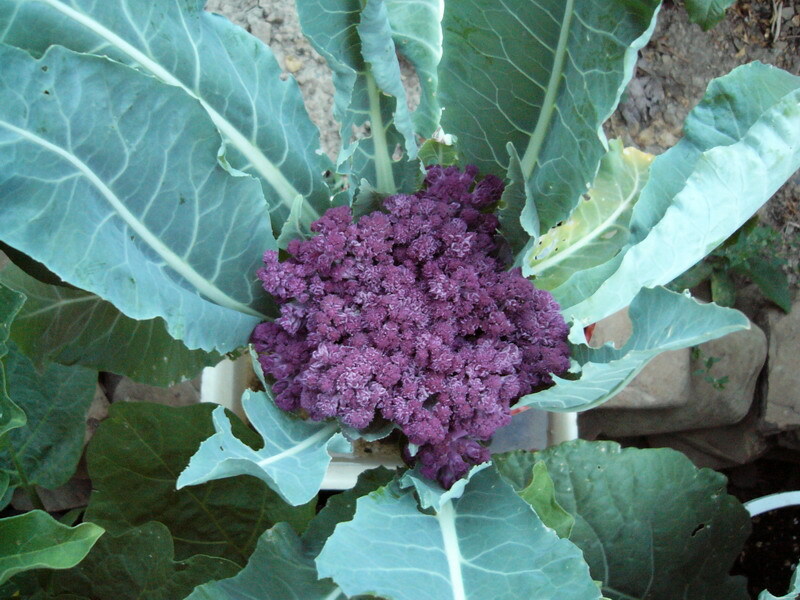 Back in spring a colleague offered me a seedling of a purple-headed cauliflower (Brassica oleracea). Cauliflowers have never been my favourite brassica, but I was intrigued, so I took it and potted it up. The curds are a beautiful shade of purple. I assume it’s edible, but I can only imagine what a bowlful of cauliflower cheese would look like made with this variety. The head is pretty small right now, so I hope it will expand as summer progresses. The lettuce (Lactuca sativa) and arugula (Eruca sativa) are well and done now. The sugar beets (Beta vulgaris) and the black Spanish radishes (Raphanus sativus var. nigrum) are well on their way, and the tomatoes (Solanum lycopersicum) are bearing well. I’m trying rapunzel (Valerianella locusta) as a summer green for the first time, but who knows how they’ll do. I guess that’s it for the vegetables for now. 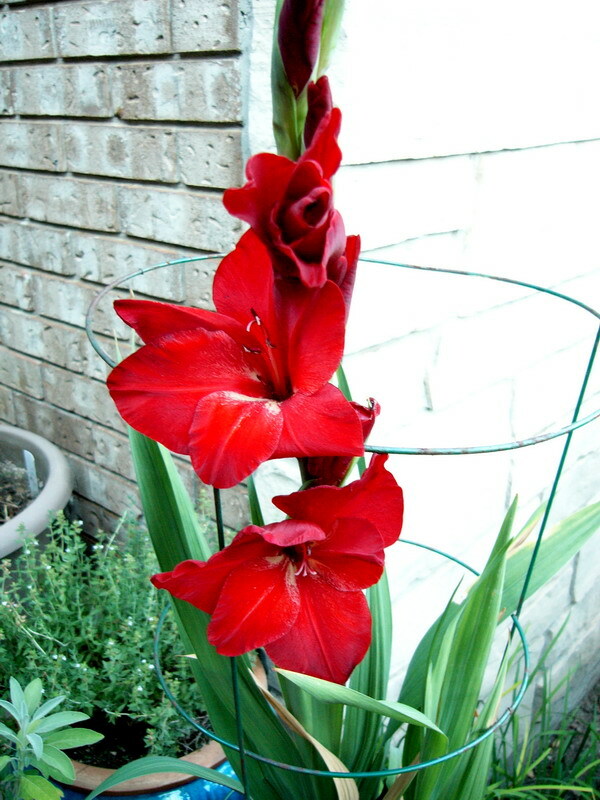 Other new developments are the ‘Black Walnut’ gladioli, which have finally bloomed. Funny thing, I planted them in batches two weeks apart, but the first batch is only a few days ahead of the second. I’m a little disappointed with the colour; I was expecting a deeper shade and I don’t see why a cultigen called ‘Black Walnut’ has a white throat. The buds are a nice deep red, however, and the blooms are huge. Finally, a couple years ago I begged some nigella (Nigella damascena, not the edible sort) seeds from a colleague. Hers were a beautiful shade of blue and I really liked them. I never got around to planting them last year, but I did this year, and – most of them have bloomed white. Sigh. Apparently her patch has turned more and more white in the past couple years too, so I guess it’s just unlucky genetics for us. 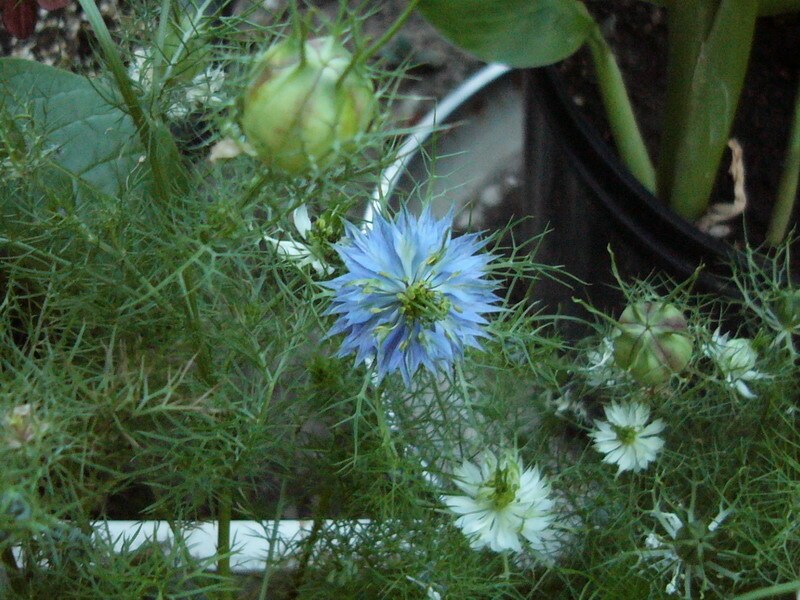 Of the several plants I got, only one has bloomed blue, so I think I’ll pull up the others before the seed ripens and keep the blue one for seed. You can see both colours in the picture below. Gosh. 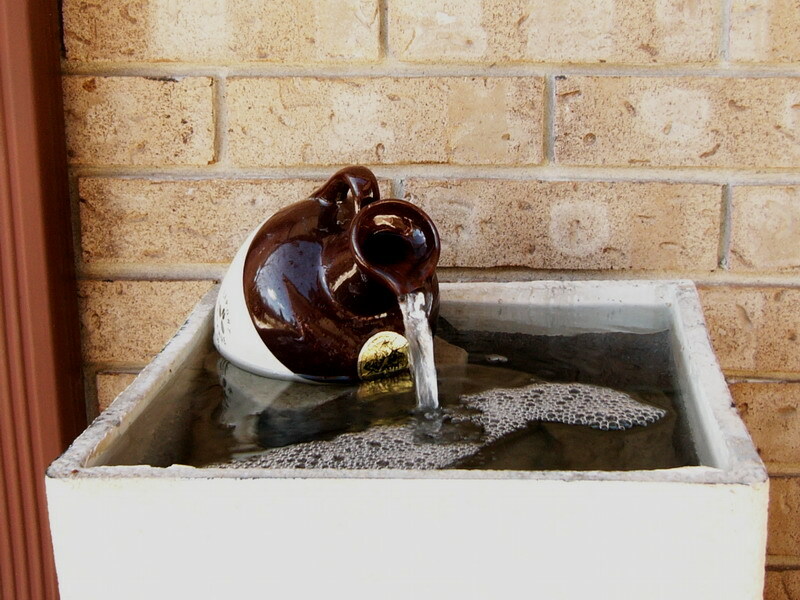 I hadn’t realised that I’d neglected this blog for so long. The garden’s certainly been busy enough, but as I expected, it’s all too easy for me to fall out of the habit of posting. Well, let’s see…the ‘Music’ garlic got planted about three weeks ago. I was really pleased with the results of the one head I got last year, so this year I got six heads. A couple days ago I planted some new black tulips; this time it’s ‘Paul Scherer’ and it will be interesting to compare it to the ‘Queen of the Night’ tulips I already have. Rounding out the black flower collection, I planted one Fritillaria persica as well. Pretty much all the tropicals and tender plants are indoors by now, except the dahlia ‘Karma Chocolate’. Although there have been a couple of frosty nights already, it seems quite happy on the front patio, which is fairly sheltered. When it finally does die down, I’ll just cut off the dead foliage and move the whole pot into the basement. I gave the three potted jasmines (Jasminum sambac) a really hard pruning and when I brought them in; they’ll readapt better to indoor conditions that way and hopefully it meant I got the entirety of the plants when I sprayed for whitefly afterwards. There’s so much more I could write about, but that’s it for now. Fall pruning and cleanup is the ongoing job at the moment: the tomato and cucumber plants are already gone and it’s too chilly to expect much more out of the ‘Albion’ strawberries. Actually, more like straight from winter to summer. It hardly felt as if we had a spring this year. Well, let’s see…everything that goes outside for summer is out and the bay window looks bare now. Somehow the ‘Lemon’ cucumbers are blooming already (cucurbits always open with male flowers first) and I really really hope the beetles stay away this year. The elder flowers (Sambucus canadensis) are set to open, the roses are opening and the American arnica (Arnica chamissonis) is in full bloom. There’s a slight lull in the general blooming at the moment; there usually is during the phasing of spring into summer. I spent most of my garden time today and yesterday weeding. Now we’ve had some regular rainfall, the ground is soft enough to get everything up by the roots; living on clay means when it’s dry, it’s also hard as a brick and attempts to weed simply result in the top growth coming off and leaving the rootstock behind to haunt you again. My point? My index finger and thumb are sore. Wah. Besides the weeding, I also planted out the ‘Red Burgundy’ okra (Abelmoschus esculentus) plants yesterday, and a couple of butterfly peas (Clitoria ternatea). The last of the overwintering Eastern Black Swallowtail chrysalides eclosed and flew off today, and I’m quite certain that the caterpillar I found feeding on the giant blue hyssop (Agastache foeniculum) last month is going to turn into a moth. Oh, and I gave a couple of the bonsai a much-needed pruning.